This entry was posted in Events Past, News on February 1, 2019 by webmaster. Children at primary schools in the West of England have taken part in a special “Lord’s Prayer” project run by the Catholic Union’s Education Committee. The project is also supported by an ecumenical group – Christian Projects. A London-based group, LOGS, based at the Church of the Most Precious Blood at London Bridge, also took part, covering schools across Greater London and Surrey. In the 2017 Children’s Handwriting and Artwork Project, children at primary schools in Somerset, Berkshire, Devon, Wiltshire and Hampshire showed their understanding of the Lord’s Prayer by writing it out and answering questions about it. 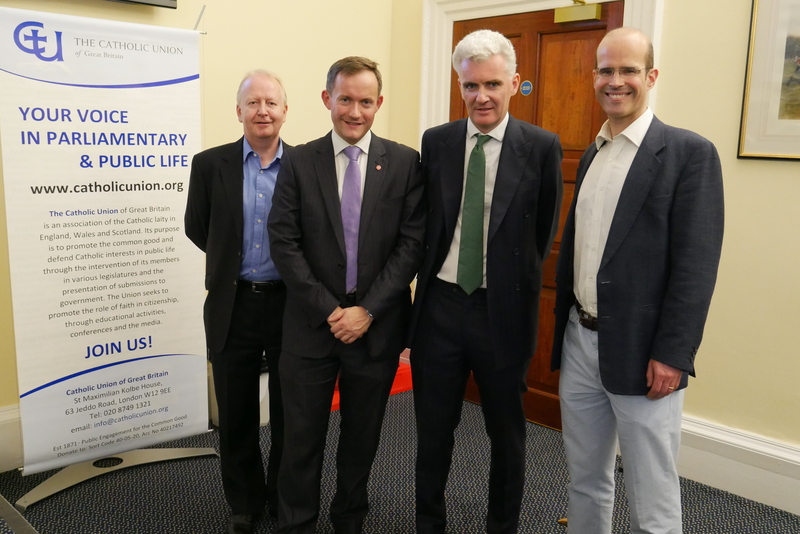 The project followed a similar venture in 2016 for schools in Yorkshire and Lancashire. Children were also asked to explain the meaning of “hallowed” and “trespasses” and many of them showed that they fully understood what these words meant. 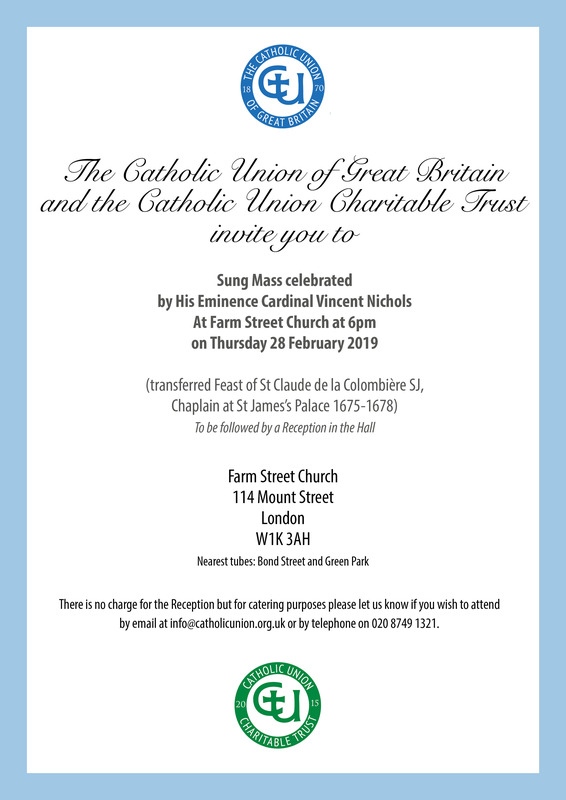 Joanna Bogle, who leads this programme, has devised a simple leaflet that is sent to voluntary aided primary schools – mostly Catholic or Church of England – inviting them to take part in the project and the entries came pouring in to the Catholic Union office. Every child taking part in the project received a commemorative prayer card with the words of the Lord’s Prayer, and the best entries received specially-commissioned prayer books. This entry was posted in News on June 12, 2017 by John Barrie. 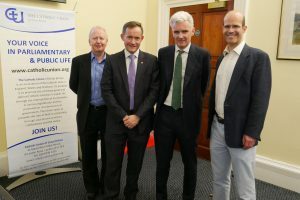 A record audience of over 100 people crowded into the Trafalgar Hall at Notre Dame University near Trafalgar Square on Thursday 1 June to hear two complementary accounts of the current situation for Christians and other persecuted minorities in the Middle East. The event entitled “Martyrs and Exiles” was organised by the Catholic Union Charitable Trust. The first speaker was Gerard Russell, the former British and UN diplomat and author of Heirs to Forgotten Kingdoms: Journeys into the Disappearing Religions of the Middle East. Gerard began by recalling the ambush and murder of a group of Coptic Christians in Egypt on 26 May who were on their way to a monastery. Sadly this is only the latest in a series of attacks on Egypt’s minority Christian community which makes up 10% of the population. Gerard said that he had wanted to show in his book that the situation does not need to be like this and that it hasn’t always been like this. In earlier centuries Christians, while not regarded as equal in Islamic societies, were often recognised and valued in the public space. In Egypt, Copts have served as Prime Minister although their situation deteriorated under President Sadat. Gerard also spoke about some of the non-Christian minorities featured in his book: the Yazidis, Druze, Mandeans, Samaritans and Zoroastrians. He said that without adopting a relativist approach, religious liberalism should strengthen our faith and make us better Christians because it helped us understand more clearly the possible origins of some of our own ideas (for example, Zoroastrian ideas about heaven and hell). All these faiths have played a part in our history and while we don’t have to agree with them, he hoped that they would survive and he observed that they have proved remarkably resilient over many periods of persecution. John Pontifex, Head of Press and Information for Aid to the Church in Need UK then spoke about his recent visit to Aleppo and the return of Christians to the Nineveh Plains. Work in Iraq and Syria is now the main focus for ACN and John showed images of the destruction in Aleppo, including many of the ancient city’s cathedrals. Aleppo has seen a 90% reduction in its Christian population and ACN supports those who remain-in many cases the poorest and weakest in society. ACN also provides support for other faiths, including Muslims from Eastern Aleppo. In Iraq, the proportion of Christians in the population has gone from 10% in 1980 to 1% in 2017, perhaps now as few as 150,000 people of whom half are displaced. Nevertheless, with Daesh now removed from Nineveh, there is the possibility for Christians to return. There are huge challenges as Christian villages have been devastated but ACN have been taking careful steps to support those who wish to return as they are best hope for the survival of the Christian community in Iraq. What is needed is a “Marshall Plan” for Iraq and Archbishop Bashar Warda of Erbil was in London in May seeking support in meetings with the Prince of Wales, Cardinal Vincent Nichols and government officials. Both speakers saw some grounds for hope amongst the destruction and killings, described by many as genocide, but a massive international effort will be required before Christians and other minorities can again live and flourish in these parts of the Middle East. 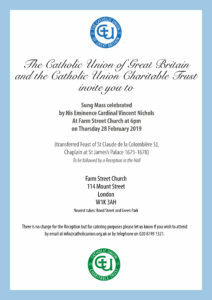 The next Catholic Union Lecture will be given by Baroness Scotland, Secretary-General of the Commonwealth on Thursday 5 October 2017 at Notre Dame University, London. This entry was posted in Events Past, News on June 6, 2017 by John Barrie. Martyrs and Exiles: Christian and other persecuted minorities in the Middle East. Gerard Russell – Former British and UN Diplomat. Author of “Heirs to Forgotten Kingdoms” (Journeys into the Disappearing Religions of the Middle East). Gerard spent 14 years representing Britain in the Middle East and speaks Arabic and Dari. His book published in 2014 chronicles the threatened religious minorities of the Middle East including the Copts, Yazidis, Zoroastrians, Druze and Samaritans. His article “The Long Good Friday” about Pope Francis’s visit to Egypt and the Copts appeared in the Catholic Herald on 28 April. John Pontifex – Head of Press and Information, Aid to the Church in Need UK. John has worked for ACN for many years and has visited many countries where Christians are persecuted. He will speak about the situation in Aleppo and plans for displaced Christians to return to the Nineveh Plains of Iraq. Venue: Notre Dame University, 1 Suffolk Street (off Trafalgar Square), London SW1Y 4HG. Lecture to be followed by a Drinks Reception. Free Admission. All Welcome. Please register on Eventbrite (Martyrs & Exiles Lecture) or with the Catholic Union Office on 020 8749 1321 or at info@catholicunion.org.uk. This entry was posted in News on May 5, 2017 by John Barrie.